MARICOPA, Arizona – All you need to do is look at the numbers to understand how important the Jetta sedan is to the Volkswagen brand. More than 16 million have been sold worldwide since its inception in 1980. This year, more than 108,000 units have been sold in the United States as of October 2017, and close to 16,000 in Canada. The Jetta currently battles the likes of the Honda Civic, Toyota Corolla, Hyundai Elantra, Mazda3 and Chevrolet Cruze in the compact sedan segment, but has lost some steam over the years, leading a second-tier sales group including the Kia Forte, Nissan Sentra, Ford Focus and Subaru Impreza. There are a lot of players involved, and if the Jetta has any chance on moving up, the all-new seventh-generation version has to do it with a combination of style, functionality and some throttle action. 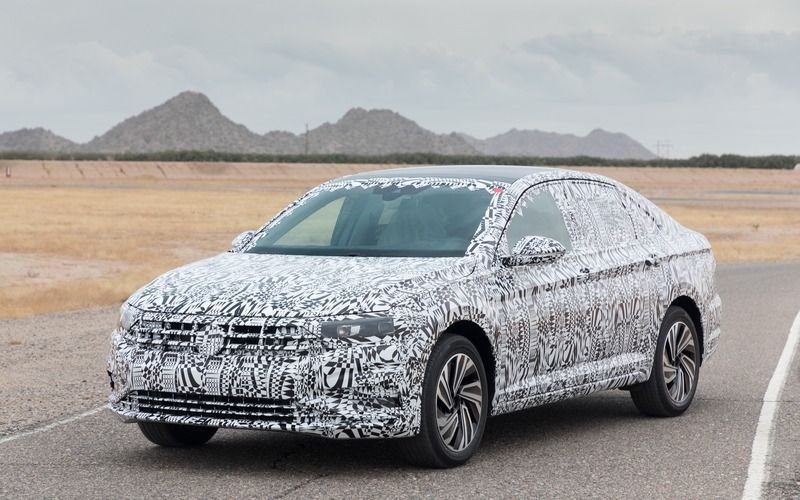 That seventh-generation 2019 Jetta will be showcased at the North American International Auto Show (NAIAS) in Detroit in early January, but we were able to get a sneak peek—well, sort of—in a camouflaged prototype at the Volkswagen Group's Arizona Proving Grounds. In the 25 years of the Arizona Proving Grounds, a group of four Canadian journalists were the first to step foot in its 1600-acre, four-kilometre-long facility. This is where all the Volkswagen brands perform durability, corrosion, weather and performance testing in order to make sure those vehicles are ready for the harsh North-American climates. Volkswagen is saving up a lot of its information for its reveal in Detroit, so we had to scrounge up bits and pieces to get some sense of what's going to come from Matthias Erb, EVP and Chief Engineering Officer North American Region, Head of Product Strategy, who was on hand for this exclusive event. As expected, the Jetta will be built off of Volkswagen's MQB platform (Modular Transverse Toolkit), the same one used by the likes of the Golf, Passat, Tiguan and Atlas. At first glance, the Jetta does seem to get a much-needed boost in style. It's hard to fully see it, but its silhouette takes on more of a slick-backed shape, moving away from its conservative nature. It addition, the sedan increases 1.7 inches in length, 0.8 inch in width, 0.2 inch in height and 1.3 inches in wheelbase from its soon-to-be outgoing iteration. These minor changes should assist in total interior space, allowing for more comfort and cargo. The MQB platform will help the Jetta in turning around its technology deficiencies. From a quick glance, it would appear that the Jetta will be at par with its sibling Golf's driver assist technologies that include lane assist, blind spot warning and adaptive cruise control. Details on where those technologies fit in its three trim lines are unknown, but we wouldn't expect them to be standard. Under the hood will be the same turbocharged, 1.4-litre unit with performance numbers expected to be close to the 150 hp and 184 lb.-ft. of torque that currently exists. Consumers will get their choice of a six-speed manual or eight-speed automatic with those automatics being equipped with start-stop technology. The sportier GLI will have a different drivetrain and will arrive closer in late 2018 or early 2019. As excited as many might be to see the new design language of the Jetta, this day was about driving impressions. The Golf has always been the vehicle that gets the most attention when it comes to driving dynamics with superior handling, but this new Jetta opened up my eyes. We were able to take the prototype through a high-speed oval, slalom and a sweeping handling course. In all of those exercises, the Jetta performed admirably without much worry. On this closed-course oval track, I was able to get the Jetta up to 210 km/h, and it didn't appear to have much strain on the car. Initial power delivery was instant thanks to its class-leading torque. Once you hit over 100 km/h, it could be pushed even more without hardly any turbo lag. At high speeds, the Jetta stayed balanced and relaxed throughout, as if it was a routine Sunday drive. Nearing the end of my stint, I was able to test its braking, and its sensitive tendencies brought the sedan to an immediate halt. It's all about getting used to the pressure applied, and on a second go, I was able to comfortably come to a gradual halt. As for its handling, the slalom and “fuel handling” course showed off its precision, a trait that many expect from a Volkswagen product. With only slight steering inputs at 50-60 km/h, the Jetta was able to comfortably slalom through the course as if it was ready for an Olympic trail run. When pushed a little harder, it got a bit trickier as brakes temporarily were applied at the end in order to avoid cone damage and an onslaught of potential embarrassment. The same feelings held true on the longer handling course, as the Jetta weaved its way around without much trouble. This is a course that had plenty of sharp narrow turns, and at the right speed, the sedan proved admirably versus my experiences with its counterparts where handling isn't particularly the strong suit. Overall, the 2019 Volkswagen Jetta proved its chops on the track, making it an impactful player in a crowded compact sedan segment. 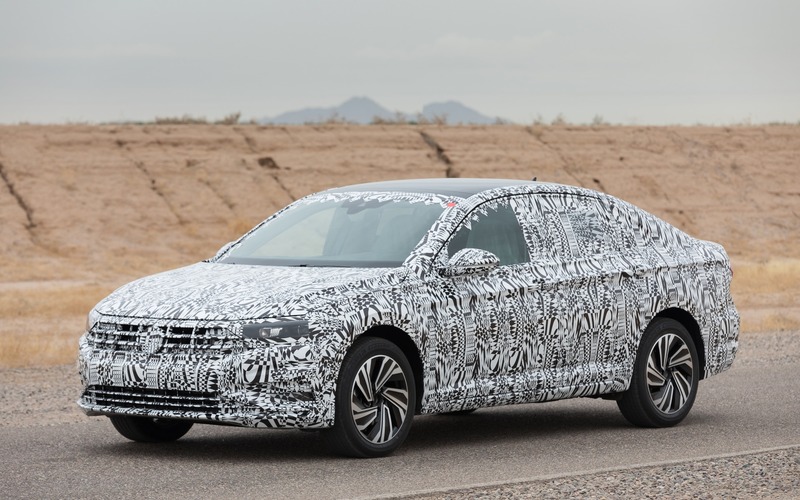 However, it should be noted that the Jetta never was seen as an inferior performance vehicle; it lost ground in emotional styling and technology, so it will be important to see how it looks without the camouflage when revealed at NAIAS in early 2018. Once it's fully uncovered, the 2019 Volkswagen Jetta is expected to hit Canadian dealerships in late April 2018. I was excited as heck to try the 2017 Volkswagen Golf GTI, since hot hatches have always had a place close to my heart. We’ve seen resurgence from automakers in this category in recent years and I jump at every chance I get to slide behind the wheel of one.